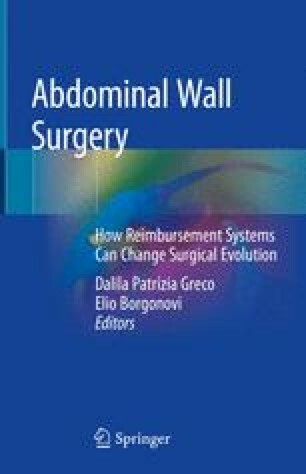 The knowledge of hernia runs deep to past, with the first references in Assyro-Babylonian and Egyptian manuscripts, and the improvement in its treatment has gone hand in hand with the cultural evolution of the human race. The natural evolution of the terrestrial mammals can be considered the oldest etiological factor in hernia onset. Assuming the erect station they exposed the weakest parts of their body to the negative effects of gravity. Many factors may predispose to this pathology, as ageing, tobacco smoke, nutritional disorders, and surgical scars. Hernia can be congenital, typical of childhood, or acquired, which is mainly observed in adults, and is an inevitable consequence of the wear and tear of living. The high prevalence of this pathology allows abdominal hernias to be considered as a social problem. The commitment of human and economic resources involved in hernia care must be assessed not only for surgical activity but extended to health care and social management too. Every year 20 million operations of inguinal hernia are performed worldwide. Due to the extreme variability of clinical forms in which this disease occurs, patients are managed clinically through different care settings, depending on the extent of the disease treated, and surgically using different techniques and devices. Classifications play important roles in organization and management of the knowledge. Different systems to classify abdominal and inguinal hernia have been proposed over the time, to better define the clinical aspect. NHS. Hospital Episode Statistics, Admitted Patient Care—England, 2002–03 [Internet]. NHS Digital. https://digital.nhs.uk/data- and-information/publications/statistical/hospital-admitted-patient-care activity/hospital-episode-statistics-admitted-patient-care-england-2002-03. Cited 3 July 2018.